The brightest of the four at magnitude 12.8 is 3C 273. The next brightest is Mrk 421 in Ursa Major at magnitude 13.3. Both of these are within reach of a 6 inch (150mm) telescope, and easily visible with an 8 inch (200mm) telescope, even in urban skies. The other two are more challenging: Mrk 501 in Hercules at magnitude 13.9 and OJ 287 in Cancer at magnitude 14.2. Three of these, Mrk 421, Mrk 501, and OJ 287, are not only quasars, but blazars, which means they are highly variable in brightness over relatively short time periods. This is particularly true for Mrk 421 and OJ 287. 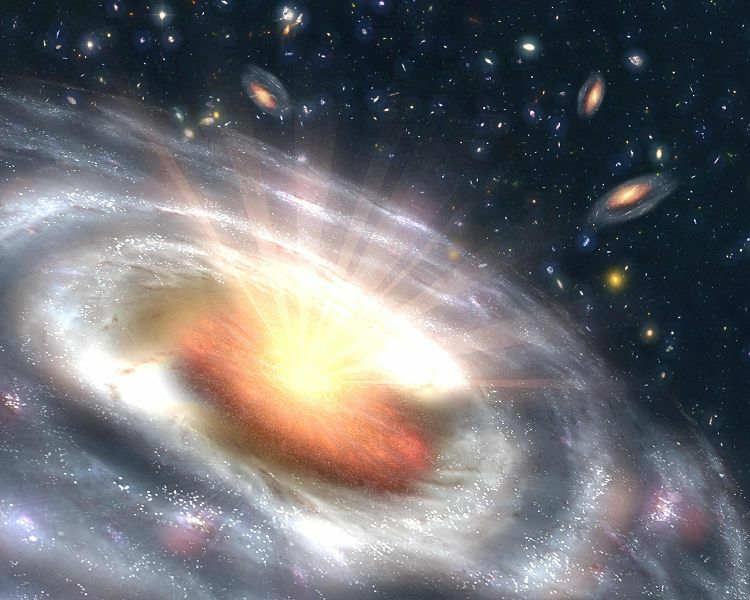 Quasars are cool objects in and of themselves. But there are other reasons that make these fascinating objects. One is the tremendous distances involved: 3C 273 is 2.5 billion light years away and OJ 287 is over 3.5 billion light years away. They are also powered by massive black holes: Mrk 421 has a black hole of about a billion solar masses; OJ 287 has a binary pair of black holes, the primary weighing in at 18 billion solar masses—the largest black hole known. Q: How powerful is your telescope? A: It’s powerful enough that even with this light pollution I can see things 2.5 billion light years away, or nearly a fifth of the way back to the Big Bang. 3C 273 was the first quasar identified and it is bright enough to be seen in many amateur telescopes. Because quasars are star-like (the term quasar was coined as an abbreviation for quasi-stellar radio sources), they show up well in washed-out skies if you use magnification to darken the background. At magnitude 12.8, under typical urban/suburban light pollution 3C 273 should be visible in 8 inch (200 mm) telescopes on nights with good transparency, but it can be very challenging for 6 inch (150 mm) telescopes on all but the most transparent nights. At 2.44 giga light years (750 megaparsecs or 1.5 x 1022 miles), 3C 273 is hands-down the farthest object brighter than 13th magnitude. While it looks no different than an ordinary star, just think how long that light took to get to you: the photons hitting your eye started their journey during the Proterozoic eon, just before Earth’s first major ice age (the Makganyene ice age), and about the time that the first generations of photosynthetic life forms triggered the Oxygen Catastrophe. Way cool! Now, the challenge to observing 3C 273 is finding it….